Let’s cut right to the chase: sometimes, we Charlotte Mason mamas confuse the ends with the means. We mix up our priorities. We start to act as if one thing is the point, when it’s actually just a tool to get us somewhere far more thrilling. It’s like confusing the journey — or, even worse, the map — with the destination. It is the duty of the nation to maintain relations of brotherly kindness with other nations; therefore it is the duty of every family, as an integral part of the nation, to be able to hold brotherly speech with the families of other nations as opportunities arise; therefore to acquire the speech of neighbouring nations is not only to secure an inlet of knowledge and a means of culture, but is a duty of that higher morality (the morality of the family) which aims at universal brotherhood; therefore every family would do well to cultivate two languages besides the mother tongue, even in the nursery. Right before this, she says it more concisely: families should learn languages so that they can show courtesy abroad. Charlotte Mason selected the Gouin method because it was effective — in fact, she believed it to be the most effective she’d encountered. But I think we can safely assume that if we stumbled across a different method which was equal or greater in effectiveness, we could use that one instead, as long as it didn’t contain anything in it which would harm the child’s character. 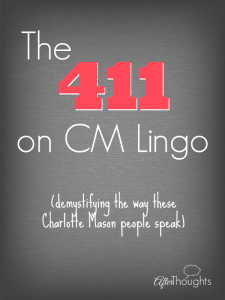 Charlotte Mason didn’t have children studying languages so that they could experience the Gouin method. Rather, the Gouin method helped children become fluent in languages so that they could practice courtesy to others. The object of athletics and gymnastics should be kept steadily to the front; enjoyment is good by the way, but is not the end; the end is the preparation of a body, available from crown to toe, for whatever behest ‘the gods’ may lay upon us. She calls this “the making of heroes” and she explains that the ancient Greeks had a far better view of the body than we do today — that they understood that the end goal of physical training is to be of service to something or someone far greater than yourself. Swedish Drill is great, and Dawn has completely sold me on its value. But the general category of physical exercise, along with the goal of training for heroism, is the goal we must keep at the forefront of our minds. For our family, this means that karate has stolen the stage for the moment. In the summers, I put them in swimming lessons because heroes can swim. Charlotte Mason didn’t schedule physical exercises into the school day so that the students could do Swedish Drill. Rather, Swedish Drill was taught because it is a healthy and efficient way of strengthening and training the body in the context of a school, with the ultimate goal being that the body is more serviceable than if it hadn’t done any exercise. Sticking to the time-tables is not an end; it’s just a means. The schedule is far from the point when it comes to what we’re doing. 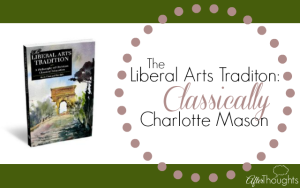 Did you know that Charlotte Mason never even tells us the details of her schedules in her volumes? We have to go look them up elsewhere. They are instructive, though. 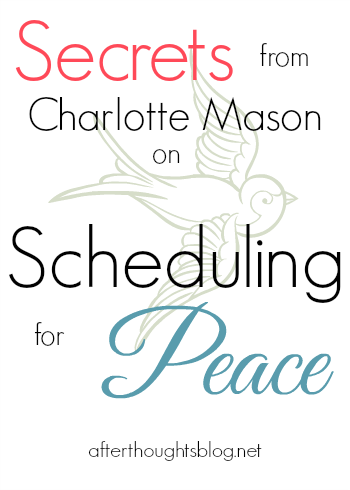 Charlotte Mason gives us many principles for managing a school day, and seeing her time-tables is helpful. It is good to see an example of how those principles might be put into action. Which principles? Well, things like short lessons, alternation of subjects, having set and limited school hours, and the like. Christy would even say it might give us some peace because it’ll show us where we’re trying to do entirely too much! But it’s easy to start viewing the scheduling system we’re using — any system — as The Boss rather than a tool. I mean, Charlotte Mason did not have schools so that children could be subjected to her time-tables, but sometimes it starts to feel like that in our homes. You know what? I don’t think Charlotte Mason ever did science for two hours straight, even in the high school years. But my son takes a physical science lab with friends, and it’s two hours long almost every single Monday afternoon. He loves it, his attention does not flag, and he’s more in love with science than ever. I call that a win all around, but if I felt like a slave to the time-tables, I might have been tempted to beat myself up for “compromising” in such a way. Charlotte Mason’s schools started at nine. They often ran six days per week. They had afternoon activities every day. All of this worked great for her. Your mileage may vary. I love the time-tables and have used them (in my own way — you can read about how I create blank templates and then use them to plan a whole year if you like) to implement AmblesideOnline effectively. I really couldn’t have taught four separate years at a time without learning a way of thinking about all of this that worked for me. But notice this: worked for me. It’s okay if what I do — or what Charlotte Mason did — doesn’t work for you. 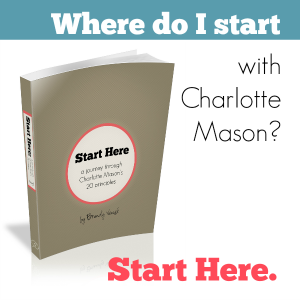 Charlotte Mason didn’t have a one-room school house, and I assume that you probably do, which means you’re going to have to adjust to fit your family. Teaching reading a certain way is not an end; it’s just a means. I’ve been asked why the phonics curriculum I developed doesn’t follow the way Charlotte Mason laid out teaching reading. You want to know why? Because I knew how to teach a child to read before I ever encountered Charlotte Mason. I used to joke about old dog and new tricks, but the reality is that the way I teach reading is simple, effective, easy, requires very little time, and the children I’ve worked with over the years enjoyed the process. It’s not for everyone, but it is for me (and some of you — you know who you are!). The bottom line is that it works. [Charlotte Mason] used to tell her students here, “Teachers must in this, as in all other matters, mix their work with brains,” for children differ, and a method which helps one child may seem a stumbling block to another. A good teacher usually has a method she prefers, and Miss Mason was quite willing to leave it to the teacher as long as the child learnt to read! As long as the child learned to read. That’s the goal folks. Charlotte Mason’s method seems to work — my friend Amy wrote a curriculum called Discover Reading that imitates it, and people like it. But you know what? My curriculum also works. Which is sort of the point. It wasn’t ever the box of ivory letters or the cutting up of pages of words — those were means. Literacy. That was the point. Which brings us to my point. Let’s not confuse the means with the ends. When we do this, we are completely sabotaging ourselves and our homeschools. Charlotte Mason believed in the ability of teachers and parents to wisely apply her principles as they saw fit (see the preface to Volume 2, for example). She warned us against systematizing education. And yet it’s so tempting — our world promotes the factory model and we are tempted to believe that we can put the children on the conveyor belt on one end and then Do All The Things Precisely along the way and then out will pop the Properly Educated Child at the end. It’s easier to focus on Doing The Things Precisely (and Mechanically) rather than thoughtfully implementing principles. Conform our ways to Charlotte Mason’s principles and each family will look a little different as they blossom and grow. But decide on an absolute standard of doing all the details, and that’s a different kind of conformity altogether, and some families will feel stifled while others will feel like failures and yet others will feel smug. And none of it is pretty, and none of it requires the use of our brains. Remember Charlotte Mason’s exhortation? Mix our work with brains. With a few solid principles in our pockets, and brains in our heads, we can stop the sabotage. We’re going to do just fine. This was a breath of fresh air. I was just thinking about this today. I couldn’t figure out this sort of feeling of guilt that I would struggle with. It’s mostly the nagging thoughts like “What if my son can’t grasp the reading program and I am faced with considering one that is not CM. Then, what am i going to do?” I was feeling like I was betraying Ms. Mason by not following the format that she laid out and I felt like I wasn’t measuring up if I have to consider another reading program that’s not recommended. My son hasn’t even started year 1 and I have had so much angst over the thoughts in my head. This has given me some confidence to move forward and use my judgement as my son’s teacher. The quote that you posted that was given to you by Anne White is just what I needed to be rid of those discouraging thoughts. Thanks so much for posting this! I was at the CM West :: Conference in the Redwoods (which was wonderful and such a blessing – thanks for that, too) and this is what our little house group sat up until 2am hashing out. It was a wonderful conversation, and the Elsie Kitching quote you shared is a telling addition. Also thanks for sharing your thoughts with all of us, and hosting a place where this kind of conversation can happen. I am! <3 It was an amazing conference. I got so much out of the talks, and came home with good adjustments to make in my homeschool practice. And the community experience was wonderful. Good, deep conversations about how and why we do what we do. I came home so refreshed. I use CM’s *framework*, but I’ve modified it a lot to fit our family. The biggest is that I’m a partial to STEM subjects so I’ve woven them into the curriculum. My 7 & 9 yr-olds get the following subjects at least 2-5x a week: math, science, music, english, history, geography, french, art, programming, spanish, chinese. All the subjects are taught with CM’s method in mind so narration, dictation, and handwriting are incorporated all over and none of the subjects are done more than 30 minutes at a time. We usually start with reading or gardening around 8am then dive into the other subjects and stop around noon. We study 3 – 5 times a week depending on what’s going on. For instance, summers are sweltering here in Louisiana (95 degrees + 95% humidity) so we work more often and mostly indoors. But right now in “winter” there’s beautiful, sunny, 70 degree weather so I’ve been taking them out for more nature walks than scheduled. Also, we’re in the middle of carnival/mardi gras so they get 2 weeks off to work on costumes and go to parades! (yes, there is a very family-friendly PG-rated side to the celebration if you’re a native). To make your point, my focus is on the ends – the morality, judeo-christian values, and character-building in CM’s method. The means are usually my own. Brilliant. The foreign language one is my favourite example. Just because. We live three years out of four overseas. This year we are in the US, and I am purchasing books and materials for first through third grade. Ambleside Online gives me the basics, but math and phonics and handwriting and, and. . . . . . Recognizing that my child is a person that is changing and growing and that our resources will be so much more limited overseas adds a stressful dimension to preparing. Trying to plan to do home school “the CM way” three years in advance is pretty overwhelming! We are doing Y0.5 currently, partly so I can “test drive” the math program before investing in three years of it. At first, my daughter was keen to “do school.” But now she is balking. I need to remember those principles and let her learn at her own pace, enjoy playing outside and building with blocks and reading just for fun. This post encourages me to focus on internalizing those principles NOW so that I will be able to flex effectively LATER. And flexing is okay. Oh, Brandy! You have just hit a home run!! DEFINITELY a Grand Slam, #2:)! Brilliant! You explained it so well! This is so good, Brandy. I think there can be an unhealthy comparison or competition about how much we follow CM’s actual practices. I’ve never used CM’s reading instruction but, like you, my kids achieved literacy anyhow. Amy Carmichael’s use of CM’s principles adapted to an Indian setting has always inspired me to think about how the principles can be worked out in other situations and in our modern day practice. You know, I have heard so many people talk about Carmichael and CM, but I have actually never read about it myself. Do you happen to have a book you’d recommend on that? I’d like to add it to my summer reading. I realize this is an old post, but thought I’d mention–I read a lot of Amy Carmichael’s original writings years ago. 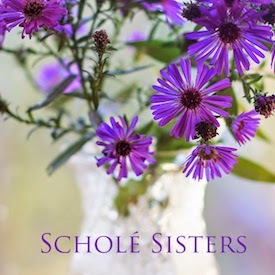 She talks about her appreciation for Charlotte Mason very specifically in her book Kohila, which deals a lot with the day-to-day process of raising and educating the Dohnavuhr children. Biographers occasionally reference AC’s ideas about education, but most of them appear to be unaware of who Charlotte Mason was so don’t mention where she got them from! Extremely helpful and well said. 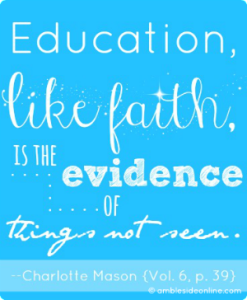 I feel like as much as I admire Charlotte Mason and her philosophies, the fact is they were designed for schools in Victorian England, not homeschools in 21st Century America and it stands to reason that there might be some judicious adaptation of her methods. There is so much we can feel beaten down by in not living up to things… it is good to be reminded to keep our eyes on the goal. Her principles and methods were for the homeschool. Classrooms came later. Even her timetables (which are mentioned, but not laid out, in her volumes) were specifically for homeschooling. A lot of people think that CM was primarily a classroom teacher but she was first and foremost about helping parents and governesses to teach children at home. My favorite article I have read so far. LOVE this!! There is grace mixed in and helps us put the emphasis on the principles. Excellent post, Brandy! There is room for more than one expression of method when we are keeping in mind the principles. 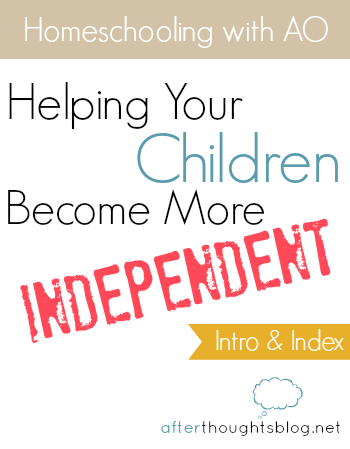 This is the point where teaching from rest enters the picture: by putting principles inn their rightful place above method we can stop trying to be legalistic and focus instead on the relationships (both between parents and children and between subjects and scholars) which enable us to press toward the desired outcome. PLEASE turn this post into a podcast episode! Loved it! I really loved this, Brandy. You said it here but I would reiterate that it’s not JUST whether something works but ALSO whether it reflects her principles — and the methods are secondary (though not unimportant since we might consider them what she considered an effective expression of principle, as you mentioned). Celeste, thanks for making this observation! So very true! I love what you said here, Celeste! ♥ In fact, it reminds me of what Aristotle (and Charlotte Mason, actually) said about virtue existing between two extremes. It’s such a hard balance to keep, and yet that balance is exactly what we have to aim for. Hear, hear on all counts!! As always Brandi, you are a breath of fresh air and this is so freeing for those of us who have gotten stuck in “Havetodoittherightwayitis” in the past and stumbled big time when that “right way” just didn’t work for us. Keeping the goal in mind and using the means that will get us there is priceless! Haha! “Havetodoittherightwayitis” — I love it! I do think that is the major risk — we can get to where we can follow steps mechanically, but if we lose the principles along the way, then we don’t know how to adjust when it isn’t working. Very good point here, Lisa! This was just exactly what I needed to hear today. I knew it, but was doubting myself this week for all the reasons you describe. “Mix it with brains” has always been my favorite Charlotte Mason quote. Me neither!! I LOVE it!!!! I don’t remember where I first heard the quote, but when I am in a CM quandary, I have a mental image of Charlotte telling me to “mix it with brains” as if I were a student teacher of hers who was vexing her patience! Perhaps this principle was specially evident during Criticism lessons on Thursday mornings when Miss Mason would criticise a student for doing what was, apparently, precisely the thing another student has been criticised for not doing the previous Thursday, thus reducing us to despair. For what were we to do? 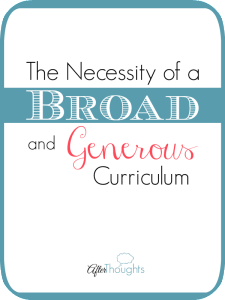 and when we asked for the precise recipe we were told to “mix it with brains.” Every lesson needs a special giving and the method is based upon broad principles which leave the teacher all the exercise of her own ingenuity. Oh, Brandy! Thank you for shouting this from the rooftops! 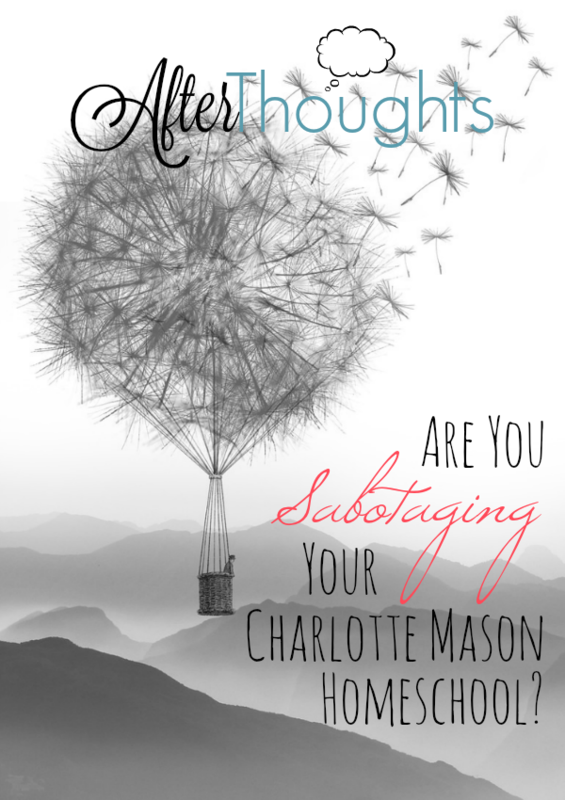 We indeed sabotage ourselves and inflict great damage on the community’s understanding of the beauty that is Charlotte Mason’s philosophy when we take our eyes off the principles and focus incessantly on the practice. I’m geekily interested in how CM implemented her principles in the day-to-day, but her example encourages me to discover ways to implement those principles in my own home — not slavishly conform to every jot and tittle of her practices. For me, it’s all about control. As we allow the Holy Spirit to lead us in spreading the feast of learning and trust Him to prepare our children’s hearts to receive all He has for them, we can step out of the way with peaceful hearts knowing our children (and their mamas) are safe in the Father’s strong arms. Thanks so much for addressing this important issue! And the learning never stops, does it? Thanks for encouraging us in the trenches, Brandy, and for always being so gracious and real. Oh.My.Goodness. This is so good. And freeing!!! I tend to be the kind of person that wants someone to tell me exactly how to do something (I’ll still do some tweaking to fit my needs) but I can easily become a slave to a certain Way and that can lead to lots of stress!! I second Catie’s comment; I want to know exactly how to do things, and then I can change them up if needed. 🙂 Brandy, this leads me to a question I have as a (continual) newbie to CM. I hope to start homeschooling my oldest for kinder in the fall (who will barely be 6 then). I wanted to have read at least one of the CM volumes by then (I’ve heard to start with Vol 6), but I get overwhelmed at the thought since I don’t find the writing easy to process, which makes me stop and go read something else. 😉 Is there a logical way to go through and break down the information in her volumes that is a bit less intimidating? I also am not sure of the best place to start from a practical perspective. I certainly wouldn’t contradict your points above about confusing means with the end, but I feel like I don’t know enough about what the CM means even are in order to have issues with confusing them with the end. Haha. Thank you for another excellent post. The way you make connections in your writing is so helpful to read! Well, my Start Here study does that — and yes, Boot Camp is intended to do that, too, just in a different way. Another option, though, is just to buy Mind to Mind by Karen Glass. It’s an abridged version of the sixth volume, which sort of makes one gasp inside! — but ultimately I think she was trying to separate it a bit from the Victorian context so that we could see the philosophy for what it is. Thank you! Having read Consider This, I was wondering about Mind to Mind and if you would recommend that. I haven’t done your Start Here study so it’s good to know that it would be useful for this. I think I get what you’re saying … even though I’ve read the principles over a few times, that’s not the same as internalizing them to the level where they kick in automatically (so to speak) when faced with the various decisions of homeschooling, i.e., the “why” guiding the “what” and the “how.” I hope I’ve said that correctly. I have afternoon post-chocolate brain. 😉 Thanks again! Yes. 🙂 To me, stress is usually a sign that I need to come up for air and assess whether I’m aligning my practice with philosophy. Thank you so much for writing this! I’ve been observing the same thing lately…people are getting all caught up in the details of exactly how CM did everything and trying to copy it exactly. I even had a blog post partially written in my head about it! Now I don’t have to write it. 🙂 If a person is faithfully following Charlotte Mason’s principles and methods, I believe there can be freedom in application, particularly since our homes are not schools. I am particularly concerned that people are getting caught up in the details of the schedule, etc, before they grasp CM’s philosophy of education. For me, I know I have to step back from the daily details once in a while and ask myself some big picture questions: am I seeing my children as born persons? Do our days reflect that education is an atmosphere, a discipline, a life? Thank you for this!!! I have recently been feeling bound in an unhealthy if not slavish way to certain CM methods by feeling guilty when I’ve successfully used something else to teach say – spelling – for example. This helped me embrace what I already knew. Thank you for your clear explanation and for freeing me from the “mom guilt” or words from other CM moms who remind me that anything other than her methods is not best.